America lost a giant this weekend when Julian Bond left us at 75. And CAF lost a friend, a founder, a mentor and a guide. Julian lived a large life, devoted to making America better. And we all are beneficiaries of his work and his wisdom. “Greater efforts and grander victories.” That was the promise made by the generation born in slavery more than 140 years ago. That was the promise made by the generation that won the great world war for democracy more than five decades ago. That was the promise made by those who brought democracy to America’s darkest corners four decades ago, and that is the promise we must all seek to honor today. Julian stayed true to that charge all of his life. At age 17, while a student at Morehouse, he organized sit-ins that challenged segregation of cafeterias, parks and theaters in Atlanta. At 75, he embraced the rise of the #BlackLivesMatter movement, seeing them as directly part of the centuries long struggle for equal justice. Julian kept on pushing. After the passage of the Voting Rights Act, he led registration drives and was one of the first legislators elected to the Georgia State House in 1965. But by then he had become a strong opponent of the Vietnam War, knowing that any hope for progress at home was being drained by the costly folly abroad. The Georgia legislature refused to seat him when he refused to repudiate his anti-war views. His constituents elected him three times; three times the legislature rejected him. Finally, the Supreme Court overruled them, and he began what became two decades in the Georgia House and Senate. By 28, he was leading an insurgent Georgia delegation to the tumultuous 1968 Chicago Democratic Party Convention. There he seconded the nomination of anti-war Senator Eugene McCarthy and had his own name placed in nomination as Vice President. His wife, attorney Pamela Horowitz, wrote that he once said his tombstone should read “race man” on one side, and “easily amused” on the other. Julian was, as the Library of Congress celebrated him, a “living legend.” He was a founder of the Southern Poverty Law Center and served as its first president. He chose to leave electoral politics to teach, guide institutions, mentor the young, write and speak. He served as chair of the NAACP from 1998 to 2010. Julian experienced first hand the fight to end segregation and win the right to vote. He celebrated the progress achieved by the movement for justice that culminated in the election of Barack Obama as president. But he didn’t let the progress blind him to the reality. And he knew only citizen movements could provide the motor force in the ongoing fight for justice. He hailed Martin Luther King Jr. as a leader, but taught repeatedly: “ Most of those who made the movement were not famous, they were the faceless. They were the nameless, the marchers with tired feet, the protesters beat back with fire hoses and billy clubs, and the unknown women and men who risked job and home and life.” It was a people’s movement who found their own leaders. “It’s always a time for civil disobedience,” he argued, noting the direct line that went from the revolt against slavery to the civil war to Emmit Till to Treyvon Martin and Sandra Bland. Bond praised the progress made by the civil rights movement, but realized that much remained to be done. Speaking to the 2015 Barbara Jordan Forum at the University of Texas, Bond taught: “While we struggle today with greater efforts and grander victories, we still are tested by hardships and adversity. The rich have been sitting at the banquet table, and the rest of us have been on the menu.” People of color are particularly beset by growing income inequalities. For example, the median wealth of white households is 20 times greater than that of black households, and 18 times greater than that of Hispanic households. The chance of imprisonment is 577 percent higher for black Americans than it is for white Americans. 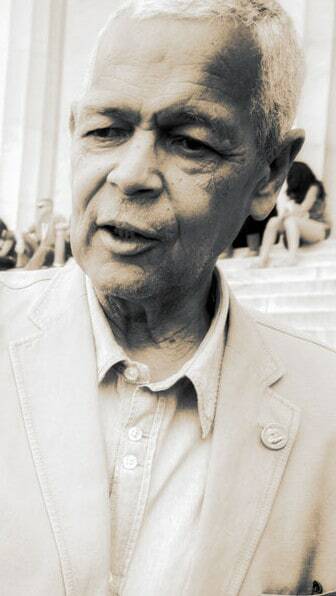 Click here to read Roger Hickey’s remembrance of Julian Bond.